I got up at 5am this morning with yellow on my mind. Like last week, I hoped to photograph yellow-headed blackbirds up at Ridgefield National Wildlife Refuge. However, the yellowheads were staying more in the interior of the marsh this week. I can’t say that I blame them, last week the red-winged blackbirds were harassing them a bit but this week they would mob the yellowheads mercilessly every time they came to the edge. Even so, my morning did turn out to be about yellow — not from blackbirds but yellowthroats and goldfinches. After spending six hours at the refuge last week, today I stayed for ten hours. I would have stayed longer but the weather was supposed to be sunny and I had only played to stay for a couple of hours and hadn’t brought enough food and water. Remind me to ignore the weatherman next time. I took far fewer pictures than last week but my quarry was more elusive. The yellowthroats were staying mostly out of sight, and when they did pop up to sing they were either chased by the redwings or by other competing yellowthroats. I was ready to call it a day and about to start the car to leave when a goldfinch popped into view. That convinced me to wait a while longer but again was ready to leave when this male yellowthroat finally appeared. I wish the out-of-focus cattail wasn’t in front of the cattail that he is actually clinging to, but I still think it’s a cute picture. I got a few others I was happy with so stay tuned for those, plus a few goldfinch pictures. 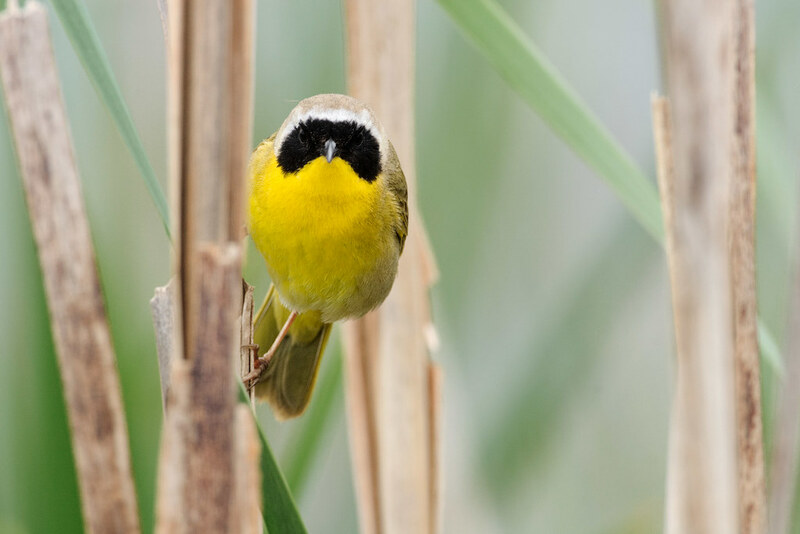 This entry was posted in Birds and tagged auto tour, cattail, common yellowthroat, perching, Ridgefield National Wildlife Refuge, River S Unit, South Quigley Lake, Washington. Bookmark the permalink.